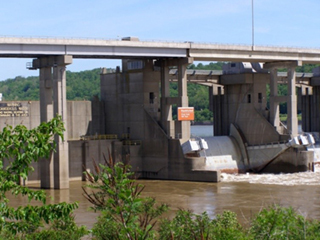 The Markland Lock and Dam is located on the Ohio River approximately five miles downstream of Warsaw, KY. The original project was constructed between March of 1959 and June of 1964. 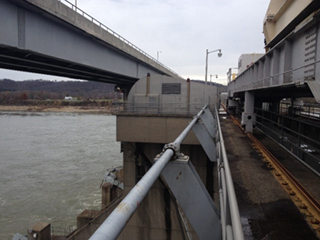 The dam is comprised of twelve tainter gates approximately 100 feet wide by 42 feet tall. 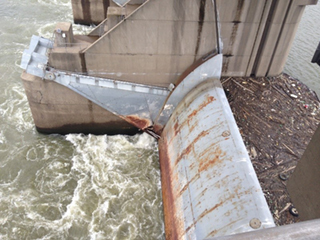 Working as a subcontractor to Q.B.S., Inc., this project includes refurbishing 7 of the 12 Markland Dam tainter gates and is currently in progress. The project scope of work includes construction of eight access platforms, tainter gate arm repairs to gates 5, 9, 10, and 11, and line shaft repairs to 7 tainter gates on bays 5, 7, 8, 9, 10, 11, and 12. All work must be completed from a floating plant on the Ohio River.